Baselworld 2018 was a blast, with strong new additions to the collections across all brands. While this is great news for the industry, and watch collectors and connoisseurs, it does make it quite difficult for us to pick out our favourites, but here it goes! It was one of the most talked about watches this edition of Baselworld, the Rolex GMT-Master II. Although previously available in white gold with the Pepsi-bezel, Rolex now introduces the watch in steel, on a Jubilee bracelet. Especially in combination with the red and bleu Cerachrom bezel insert makes this for one very tempting watch, that stands with one hand in Rolex past, and the other in the future, as it is fitted with caliber 3285, featuring the patented Chronergy escapement. As always was Hublot once again on fire during Baselworld. This is all the more extraordinary as they already introduced their fair amount of novelties two months earlier during the Geneva Days. With the Big Bang Tourbillon Power Reserve 5 Days Sapphire shows Hublot once again how well they master sapphire. Now they not only use it for the case but in the movement as well. The result is an unprecedented level of transparency, which is all the more cool as it is fitted with a flying tourbillon as well! Grand Seiko is celebrating the twentieth anniversary of 9S caliber with a few stunning limited editions and among them this platinum Hi-Beat 36000 V.F.A. The case has been redesigned by Nobuhiro Kosugi, who also designed the original Caliber 9S model in 1998. The movement itself can be admired through the case back. For the platinum model, it is “Very Fine Adjusted” which means that it went through the 34-day testing program, which as a result makes the 9S85 Hi-Beat 36000 caliber perform within a tolerance of +3 and -1 seconds per day. At Baselworld Jaquet Droz showed us a side of themselves that we haven’t seen before. With the Grande Seconde Skelet – One Ceramic, they not only created a beautiful skeleton watch, yet fitted it with a ceramic case as well. The result is a very contemporary watch, yet in that traditional Jaquet Droz style, with the oversized subdial for the seconds at six o’clock. While the majority of the skeleton watches is manual wind, this one is automatic, and its 18-karat red gold oscillating weight, which you can see moving around from the front of the watch, makes this watch all the more enticing! Granted, you need to like green, but when you do, the Sixties Panorama Date by Glashütte Original is an amazing watch! Glashütte Original takes full advantage of the fact that they have a dial manufacture as well and created this varnished green and black dial with imprint pattern and dégradé effect. The result can perhaps best de described as raindrops on your car’s windshield when you are driving, just before you activate the whippers. Inside the Sixties Panorama Date we find automatic manufacture movement 39-47, which also supports the large date function, which Glashütte Original integrated so masterfully into the overall design, that we had to select it as one of our favorites from Baselworld 2018! At Baselworld Patek Philippe introduced the most complicated Nautilus to date, which features a perpetual calendar. It is fitted with Caliber 240 Q, which has powered some of the most iconic perpetual calendars of the brand. For this Nautilus Patek Philippe combines it with a white gold case and bracelet and a beautiful blue sunburst dial. The result is an instant grail watch, and despite the very strong line-up this year by Patek Philippe, we have to vote this one as our favourite! Blancpain most certainly surprised with a complicated watch that got the beautiful name: Tourbillon Volant Heure Sautante Minute Rétrograde. The name already gives away what makes this watch so special, as next to a flying tourbillon, it features a jump hour display, along with a retrograde minute index. All these complications are brought together on a dial of Grand Feu enamel, making this great watch, even more special! With the Defy Zero G Zenith had redesigned the gyroscopic module we knew already of the Academy Christophe Colomb with great success. It can now fit in a regular watch case, without the need for the domes in the sapphire. The result is a very technical looking, contemporary watch that fits right in with the Defy El Primero 21 and the Defy LAB. Its manual-wind El Primero 8812S calibre, which oscillates at 5 Hz, consists out of no less than 324 parts, of which 139 are dedicated to the gyroscopic carriage. The result is a watch that is nothing short of mesmerizing! Breguet expanded their Marine collection with three new models. While they are all impressive, we were especially taken by the Marine Alarme Musicale 5547. It comes in a titanium case with sunburst slate grey dial, in 18-carat white gold with a blue dial, or like the one here in 18-carat rose gold with silvered dial. Fitted with caliber 519F/1, it combines a second time-zone with an alarm function. As this is a Breguet, the striking mechanism is rather sophisticated and sounds like a ship’s bell, making it all the more appropriate for this watch. Yes, Bulgari set another world record with the Octo Finissimo Tourbillon Automatic, and while a very impressive watch, it was the Octo Finissimo Minute Repeater Carbon that stole our heart. While this is indeed the thinnest minute repeater you can get, with an overall height of only 6.85mm, it now features a case, bracelet, and even dial made from carbon. 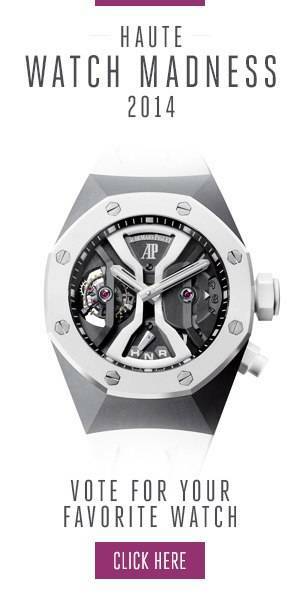 The result is a watch that sounds amazing, looks amazing and weights next to nothing.